What Makes a Good Audiobook Great? What makes a great audiobook? And conversely, what makes an audiobook not so great? I’ll be sharing my opinions on the topic today, and I’d love to hear your thoughts on it too. I’ve been known to claim I’d happily listen to certain favorite narrators read the phone book. And to an extent, I would. But really, if I’m being honest, I’d much rather listen to them read something I’m actually interested in. Especially if it’s something that lends itself well to the audio format. Let’s face it. The phone book is meant to be searched as needed, not read linearly. The content makes a huge difference in the reader’s enjoyment. That’s why reference books with complex charts that readers may need to refer back to and graphic novels that rely heavily on images to communicate meaning probably won’t make for great listening experiences. In my reviews, I tend to talk a lot about characters’ voices, but the narrator’s own voice generally comes through in the bits of exposition scattered amongst the lines of dialogue. A particularly raspy or shrill or otherwise distracting voice can ruin an otherwise good audiobook. Some vocal habits like trailing off in volume at the ends of sentences, overemphasizing the ends of words, frequent mispronunciations, and extraneous noises like loud breathing outside of character, can adversely impact a reader’s enjoyment. On the other hand, a pleasant and natural sounding voice can blend itself into the background, allowing the story space to shine. The characters’ voices a narrator creates for an audio production can make or break the audiobook. While I’ve heard there are readers out there who prefer an audiobook read matter-of-factly and without the use of distinctive voices for different characters, I tend to think that approach takes much of the fun out of the format. Personally, I love it when a narrator makes good use of differences in character voices. Emphasis on good use. Too unique or nasal or whiny and a character’s voice can quickly become annoying. Similarly, too much exaggerated effort in creating a character of the opposite gender, can lead to some eye-rolling moments for the reader. But on the other hand, one of the worst performances I’ve had the dubious honor of listening to was one where the narrator made absolutely no effort to distinguish voices or to pause between speakers. This made it harder for me to connect with the characters, but even more problematically, I found myself getting lost in conversations, unsure when one character stopped speaking and the next began. In short, when it comes to character voices, moderation is a good thing. Variations in voices within a range comfortable for the narrator can translate to a fabulous listening experience for the reader. Pauses between paragraphs or lines of dialogue, and especially between scenes and chapters can be important to the reader’s understanding of the audiobook. Likewise, a narrator reading excessively fast or slow can result in a frustrating listening experience. At the same time, judicious use of variations in pacing, such as speeding up the reading during a high-intensity moment in a thriller, or slowing to savor a romantic or otherwise emotional moment for the characters, can heighten the reader’s connection to the story. As for enunciation, clarity is king. If I can’t understand what’s being read, or even if it requires too much concentration to catch all the words, it’s going to impact my enjoyment of the story. I realize contracts and rights negotiations and timing and … life … can get in the way of keeping the same narrator throughout a series. But (for the people out there who decide these things) please, pretty please try? One of my favorite audio series was mostly read by one narrator who did a fabulous job of both British and southern accents across genders. I was spoiled, and I fell in love with the characters. And then my heart was broken when a short story featuring the same characters was released by a different audio publisher with a different narrator who didn’t attempt their accents at all. It felt like I was meeting brand new people rather than visiting with old friends. That was when it hit home just how much difference it can make for the character voices and reading style to be consistent from one book to the next within a series. Just listening to the voices in one book can bring back memories of the characters as read in an earlier book months or years ago and help tie the stories together. So, yeah, sometimes it works to bring back the same narrator, and sometimes things get in the way of that, but whenever possible… pretty please? So far, we’ve discussed content, the narrator’s voice, characters’ voices, pacing and enunciation, and continuity within a series as factors in making an audiobook great. But not everything can be that simply explained. Maybe, a narrator’s emotional connection to what he or she is reading shows through in the final production and draws the reader in. Or maybe multiple readers worked together to create a seamless theatrical production. Sometimes it’s easy to point to one or two, or ten features of an audiobook that come together to make for a fabulous read. Other times, it’s not so easy to explain why the total experience is greater than the sum of its parts. Either way, I love discovering and listening to a great audiobook. 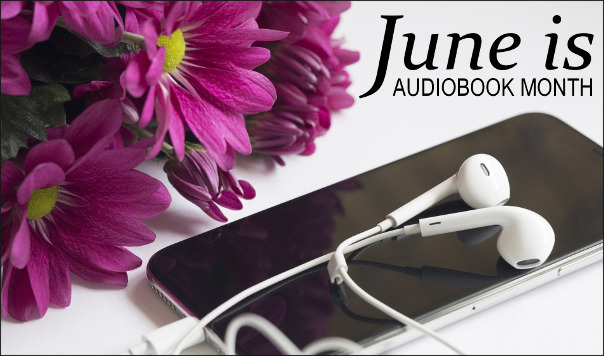 In celebration of June is Audiobook Month and because I #LoveAudiobooks, I’m featuring audiobooks on my blog, pretty much all month long. 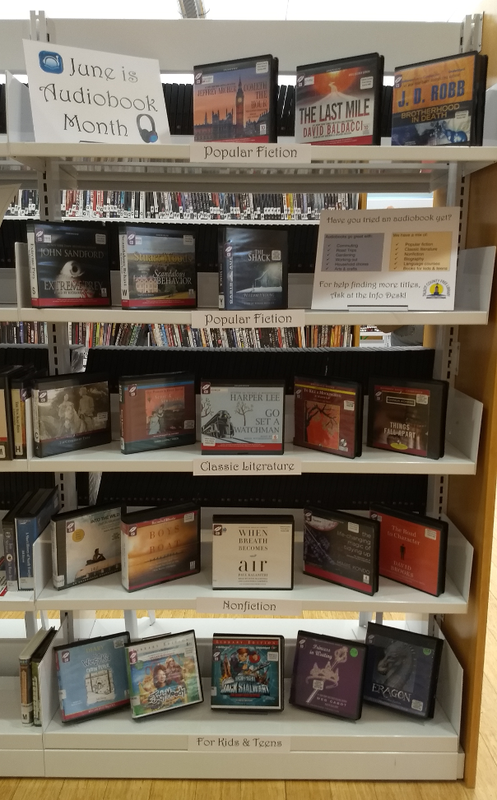 In fact, I’m so excited about celebrating audiobooks, I even put together this display at the local library where I do my librarian-ing. The audiobooks are already disappearing. Pretty cool, huh? Weekly free downloads this summer aimed at teens at audiobooksync.com (including If I Run, a Christian fiction title I’m particularly excited about by Terri Blackstock, scheduled to be featured June 8-14). Recorded Books is posting entertaining video clips featuring popular narrators on their Facebook page all month long. Free downloads of the audio KJV New Testament at christianaudio this month, as well as their Twice Yearly sale (through June 23rd) where they discount almost all digital downloads to $7.49 each. And more! Check out the official hashtag #LoveAudiobooks on Twitter to see how others are celebrating audiobooks this month. And please, don’t forget to check back here for more audiobook fun, including reviews of some Christian fiction audiobooks I particularly enjoyed, as well as my list of the upcoming audiobooks I’m most looking forward to this summer. Meanwhile, I’d love to hear from you in the comments! Are you an audiobook listener too? Know of any must-check-out audio-themed events or promos going on this month?